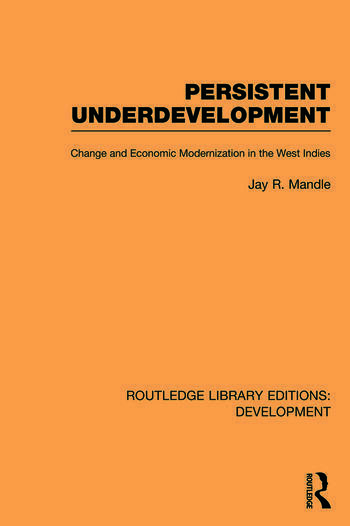 First published in 1996, this insightful and informative text examines the post-emancipation and recent economic history of the Commonwealth Caribbean. Jay R. Mandle offers an explanation of the region’s continuing underdevelopment. Through the use of an analytical framework derived from the works of Marx and Kuznets, the book focuses attention on technological change as the driving force behind economic modernization. Persistent Underdevelopment begins by exploring how plantation agriculture had a limiting effect on industrial growth. Ultimately, plantation dominance receded; technological stagnation continued, however, and, under British colonial policy the Caribbean failed to modernise. The post-World War II era brought new efforts at modernisation through the economic policies of the left regimes of Manley, Burnham and Bishop. The concluding chapters point the way to policies that would enable the Caribbean to escape its current poverty and become an effective participant in world markets, finally achieving the goal of modern economic development.